A pair of strange new worlds that blur the boundaries between planets and stars have been discovered beyond our Solar System. A few dozen such objects have been identified in recent years but this is the first set of "twins". Dubbed "planemos", they circle each other rather than orbiting a star. Their existence challenges current theories about the formation of planets and stars, astronomers report in the journal Science. "This is a truly remarkable pair of twins - each having only about 1% the mass of our Sun," said Ray Jayawardhana of the University of Toronto, co-author of the Science paper. "Its mere existence is a surprise, and its origin and fate a bit of a mystery." The pair belongs to what some astronomers believe is a new class of planet-like objects floating through space; so-called planetary mass objects, or "planemos", which are not bound to stars. They appear to have been forged from a contracting gas cloud, in a similar way to stars, but are much too cool to be true stars. 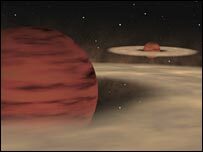 And while they have similar masses to many of the giant planets discovered beyond our Solar System (the larger weighs in at 14 times the mass of Jupiter and the other is about seven times more massive), they are not thought to be true planets either. "We are resisting the temptation to call it a 'double planet' because this pair probably didn't form the way that planets in our Solar System did," said co-researcher Valentin Ivanov of the European Southern Observatory (ESO) in Santiago, Chile. The two objects have similar spectra and colours, suggesting that they formed at the same time about a million years ago. They are separated by about six times the distance between the Sun and Pluto, and can be found in the Ophiuchus star-forming region some 400 light years away. They go under the official name Oph 162225-240515, or Oph 1622 for short. "Recent discoveries have revealed an amazing diversity of worlds out there," said Dr Jayawardhana. "Still, the Oph 1622 pair stands out as one of the most intriguing, if not peculiar." His colleague, Dr Ivanov, said they were curious to find out whether such pairs are common or rare. "The answer could shed light on how free-floating planetary-mass objects form," he added. Oph 1622 was discovered using the ESO's New Technology Telescope at La Silla, Chile. Follow-up studies were conducted with the ESO's Very Large Telescope.